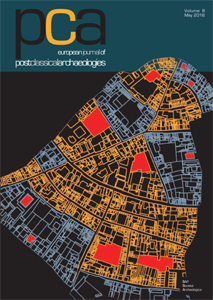 European Journal of Post-Classical Archaeologies (PCA) is an independent, international, peer-reviewed journal devoted to the communication of post-classical research. PCA publishes a variety of manuscript types, including original research, discussions and review articles. Topics of interest include all subjects that relate to the science and practice of archaeology, particularly multidisciplinary research which use specialist methodologies, such as zooarchaeology, paleobotany, archaeometallurgy, archaeometry, spatial analysis, as well as other experimental methodologies applied to the archaeology of post-classical Europe. A particular interest is also devoted to subjects related to public archaeology, the communication of archaeology, ethics and archaeological practice and other relevant aspects which relate archaeology to the wider world. “European Journal of Post-Classical Archaeologies” was approved on 2015 according to ERIH PLUS criteria for inclusion and has been accepted for coverage in selected Elsevier product(s) starting with 2017 material. It is classified A by ANVUR (Agenzia Nazionale di Valutazione del sistema Universitario e della Ricerca). Submission of a manuscript implies that the work has not been published before, that it is not under consideration for publication elsewhere and that it has been approved by all co-authors. Each author must clear reproduction rights for any photos or illustration, credited to a third party that he wishes to use (including content found on the Internet). For more information about ethics (including plagiarism) and copyright practices and guidelines please visit the web site www.postclassical.it. Post-Classical Archaeologies’s manuscript review process is rigorous and is intended to identify the strengths and weaknesses in each submitted manuscript, to determine which manuscripts are suitable for publication, and to work with the authors to improve their manuscript prior to publication. This journal has the option to publish in gold open access. For information on policies and fees please visit the section Ethics and open access policies. How to quote: please use “PCA” as abbreviation and “Post-Classical Archaeologies” as full title.